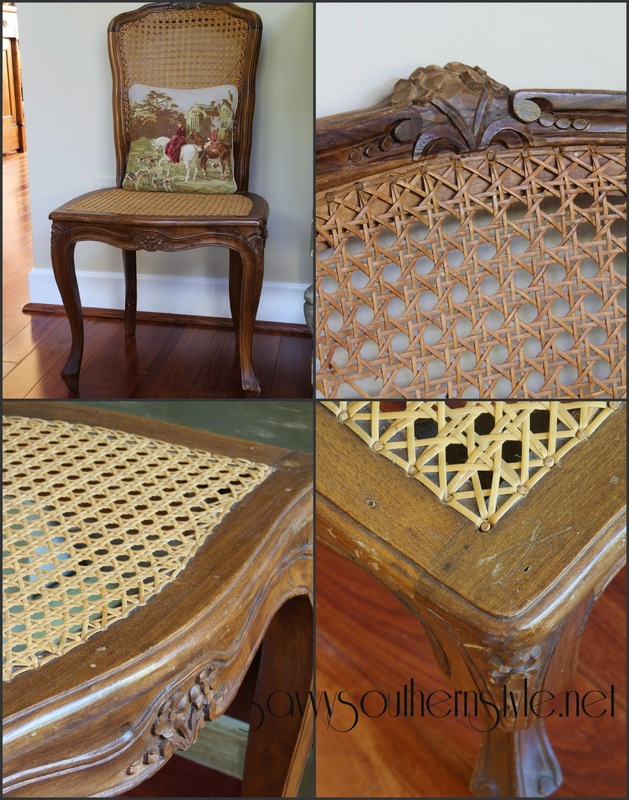 It's time for another monthly edition of Creating French Country Style and this month we're talking French chairs. I have a hard time passing up a pretty chair when I come across one at an antique mall or flea market. I have heard others say that, too. This is my favorite chair and it is actually French. This beauty was spotted on my trip to France last year. I'm using it in the master bedroom now, but it was in the foyer. I have a different chair in the foyer for now. I was actually finished paying for my items in a flea market in France when on my way out the door I spied this beauty. I gasped and sat in it and then asked how much. It had me at the rush seat. The patina on this chair is perfect and it will NOT be painted......period. This chair isn't French, but is a nice tufted and linen French style. The mate sits in the sitting room. These chairs were found on overstock.com. My breakfast room chairs have a French country style look, but were actually made in China. I get asked all the time how I painted these and what I used, but I purchased them this way. This French cafe style chair is from the Restoration Hardware outlet. And this last little beauty was found at a local flea market back in February. I just love caned chairs. I sure hope y'all will check out the other ladies' French chairs. You do have a great number of pretty chairs. The one you found in France is a beauty!!! So fun spending time with you all! Gorgeous chairs! I always love looking at photos of your beautiful home Kim! I have a hard time turning away from a beautiful chair too. That rush bottom French chair is amazing! Pretty pretty Kim- and I love the ones you shared that have that perfect patina too. Sigh... ladies this month topic has my heart. My maternal grandmother was French and brought a lot of French pieces with her via ship. I grew up with chairs like the ones you are sharing.... makes me miss her. Great chairs Kim...you cant go wrong with french chairs! Love all your pretty chairs. The french chair from France is my favorite. So gorgeous. I used to have a chair addiction too but for some reason I got rid of them all and was over it. LOL you have a beautiful supply of them and all the pillows are perfect for a French theme. They are all pretty and I realized that I have a few French styled chairs too!!! I love all your chairs, the last one I owned myself just like yours, I too love cane, yet at a week moment in down sizing in my now investment home I ended up selling it to a client, my mistake. The rush seat chair I can see why your heart skipped a beat over it, and to find real rush and not paper ones we so often see is the best part of this French chair. Love your post and it inspires me to hunt some great chairs down, in fact much needed accent chairs. I can't pass a pretty chair either... I could sit in a different chair every hour of the day in my tiny cottage because I have so many... But guess what? Now I'm pretty sure I need at least one more: a tufted one like yours: it looks so comfortable and elegant. All of your chairs are very French. I love them all. Kim, your home exudes the charm and beauty of France! All your chairs have found a happy home with you. The one you found in France is stunning! I love it's rich look... and rush seat! Beautiful... as always my friend! What I love about each of them is that they are simple, and comfy-looking. Nothing overly fussy. Beauties, all! I love your home Kim!!! I can see why you won't paint your chair from France. I don't blame you!! They are all stunners, but I think that one is my favorite. All of your chairs and by the way, benches too, are beautiful! :) I cannot pick a favorite, they all are! I was just lucky to find four free chairs similar to the ones you have in your breakfast room but they're stained, dark stained. I'm now debating on whether to paint them or not.